These days, business productivity depends largely on the ability to securely access and interact with a wide range of information over mobile devices, such as tablets and smartphones. From sales executives to field technicians, the demand for accessing corporate content securely on mobile devices is growing exponentially. In the past, implementing security measures to protect corporate content has involved VPNs, intranets, firewalls and passwords. However the increasing uptake of mobile devices in corporate settings means security measures must be implemented over a plethora of networks and devices. 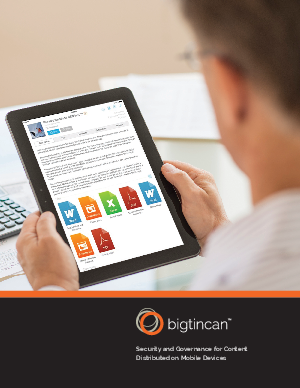 bigtincan has created a powerful solution with bigtincan hub. An application for mobile devices, it allows for the distribution, management and governance of a range of content, including documents and rich media content, with enterprise-grade security.